Lady Snowblood is most famously known for being the film that inspired (some would say was ripped off by) Quentin Tarantino’s Kill Bill Vol. 1. Between the plot, costuming, fight scenes, music, and cinematography, Kill Bill is effectively a modern, Westernized version of Lady Snowblood. That may seem like an exaggeration but I assure you, Lady Snowblood is the film that most heavily inspired Tarantino’s first entry into the Kill Bill series. I’m not going to go into details on this, as this has been covered so heavily everywhere else on the internet. Some light Googling will get you some specific examples of what I mean. That being said, I don’t think the existence of either film takes away from the enjoyment you can get from the other. It is fun to poke holes at things like this, but both movies stand well on their own as fine films. I was incredibly fortunate to be able to track down the Criterion release of Lady Snowblood and its sequel Lady Snowblood: Love Song of Vengeance, so I’ve had the awesome pleasure of seeing it in its 2k restoration. This is a film that definitely deserves that kind of treatment, as many of the shots are composed beautifully, and are made even better by the deeper and more vibrant colours that the remaster offers. From the snowy streets of anytown, Japan, to the breathtaking ocean-side peninsula where Yuki trains to the masquerade ball that she eventually ends up infiltrating, everything looks outstanding. Lady Snowblood’s director Toshiya Fujita originally worked as a cinematographer for other projects, and it shows here. His shot composition is impeccable, and his use of camera movement (or lack thereof in some scenes) helps settle the viewer into the film’s world with ease. The action scenes, which there are plenty of, showcase some great long takes and some wild movement around and between the actors, making swords, limbs, and fountains of blood fly across the screen with fluidity. And fountains of blood there are. Being adapted from a manga of the same name, Lady Snowblood retains some of the over-the-top qualities of the source material. A lot of the acting is excessively emotive like would be on a stage play or in a drawn medium. Many of the characters’ movements are amplified which is nice, because many of the fight scenes are over in seconds. Yuki is violence personified, she’s constantly referred to as an asura which is translated in the film as a sort of demon or demi-god. With a flick of her wrist and a flash of her blade, she can dispatch any foe and can do so beautifully, to boot. The blood in the film is a vibrant, firetruck red, erupting out of any wound, splattering and contrasting against on clothes, walls, and faces. Speaking (writing?) of faces, can we just take a moment to appreciate Meiko Kaji’s? 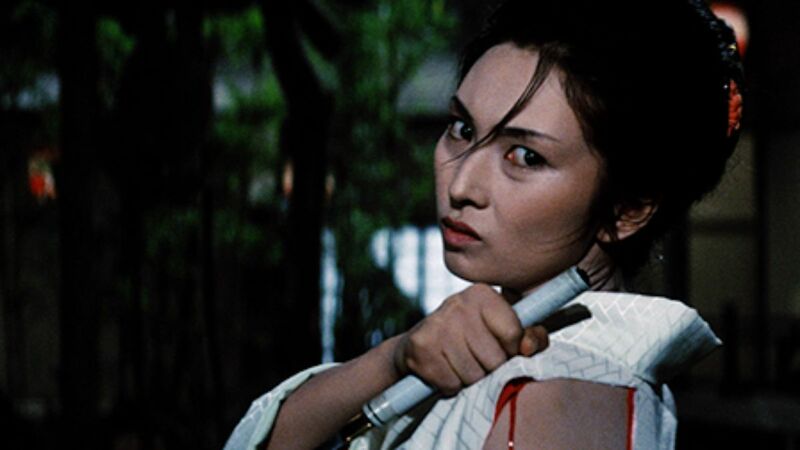 While she definitely has more lines of dialogue in Lady Snowblood than she does in the Female Prisoner Scorpion films, there is no shortage of silent fiery glares that can pierce even the steel of a Hattori Hansō sword. When on a warpath, Kaji is able to convey the intense, burning rage inside Yuki as well as the elegance and serene control she has over each combat scenario. Again, Yuki is treated as a sort of divine creature more than a regular person in this film, and I can’t think of a better actress to play a character equal parts femme and fatale. Lady Snowblood is what I wish Female Prisoner Scorpion was. You can tell that this could have easily become a boring, exploitative martial arts revenge flick, but the artistry brought to the screen by Toshiya Fujita and the interesting way the narrative structure of the film provides information to the audience elevates this film. I wouldn’t go as so far to say that this is an Arthouse or even artsy movie, at it’s heart this film is a hack-and-slash action picture through and through. But just because it isn’t super arsty, doesn’t mean that it can’t look beautiful or have interesting ideas in it. If you’re looking for a relatively simple movie to wind down with after a long day that provides equal parts eye candy and blood-drenched carnage, look no further than Lady Snowblood.